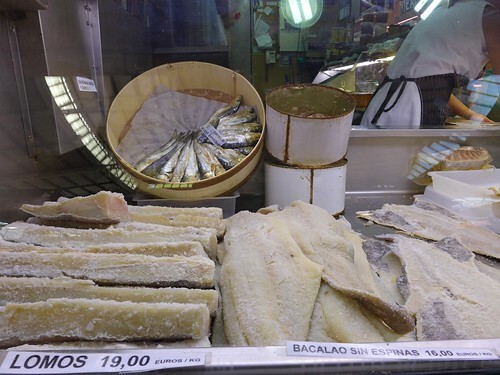 The city of Valencia has many attractions such as the ciudad de las artes y las ciencas or the marvelous old part of the city. 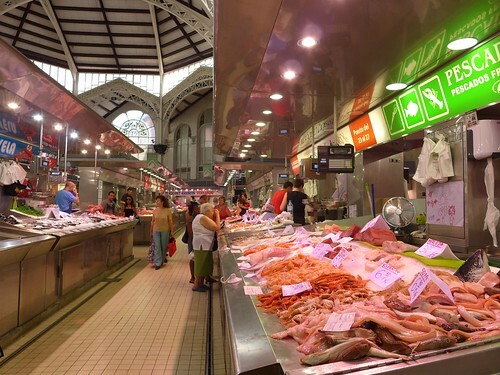 But as a foodie, if there’s one thing not miss, it is a visit of the city’s central market. 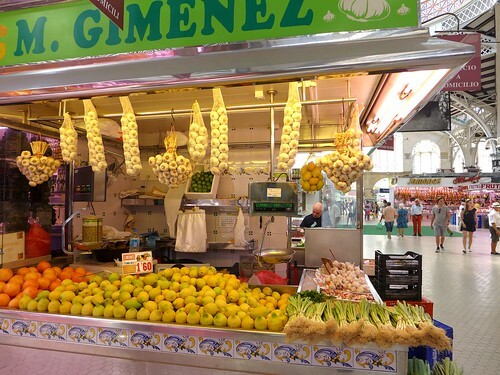 The booths are displaying produce of such richness and variety coming from the earth and the sea, from the orchards of the surroundings and from the rest of Spain (such as the Pimenton from Murcia pictured above) – it tells you much about the city’s economical strength in the past, but foremost about the importance of good food for Valencianos. 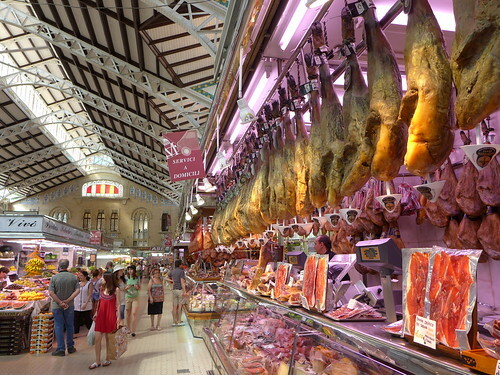 Obviously priorities are well set here. 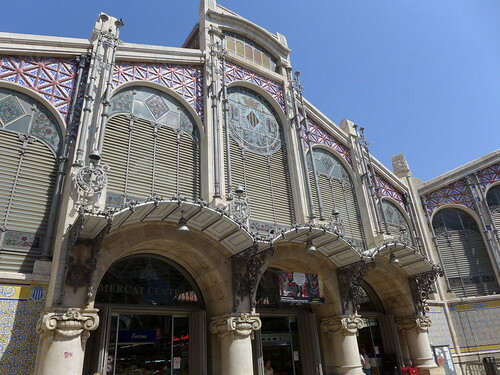 The market building was completed in 1928, based on plans by Alejandro Soler March and Francisco Guardia Vial who both had studied architecture in Barcelona. 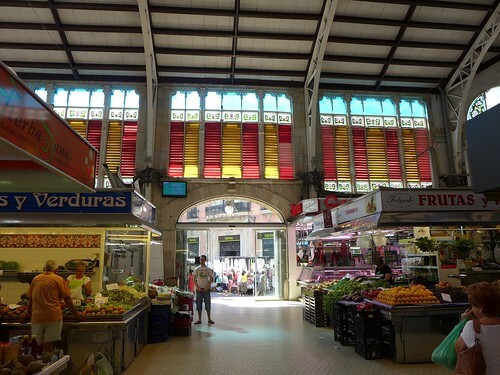 Markets with such impressive architecture are rare in Northern Europe. 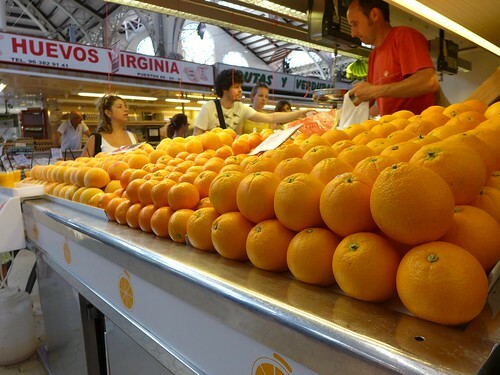 Oranges, of course. 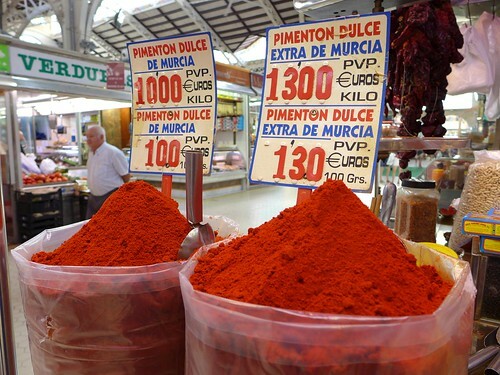 They don’t have to travel far around here. 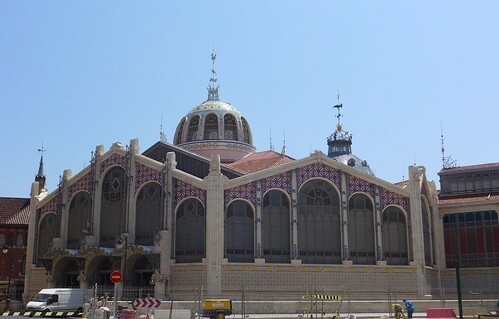 Only here a market building is capped with a central dome that would make any larger church proud. 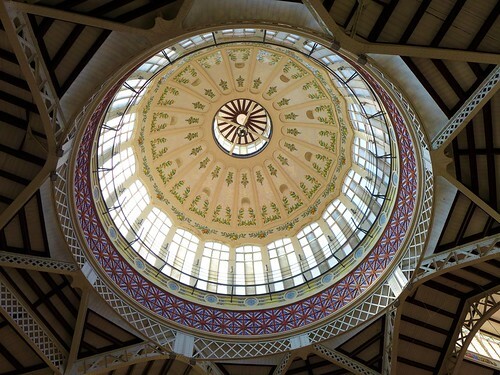 It is 30 meters high. So these beasts are called garrofon. 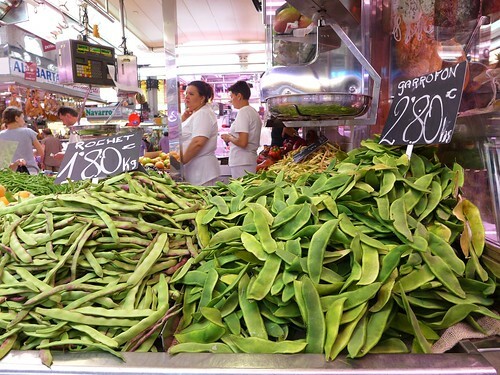 They are the beans that are actually used as a main ingredient to the original paella valenciana. Just so you know. 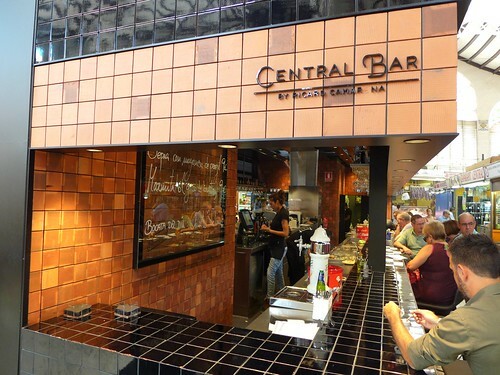 At Central Bar one can have great breakfast, With a cold beer or Cava if you’re up for it. 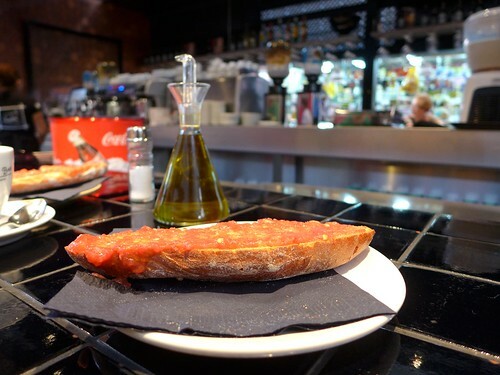 Typical breakfast here: delicious pan con tomat. 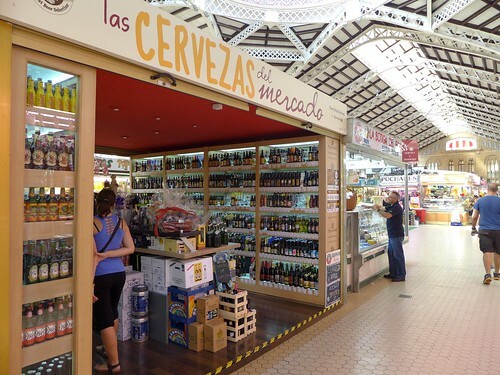 But there are also great untypical market stores such as las cervezas de mercado, a beer store specialized in microbrews from all around the world. 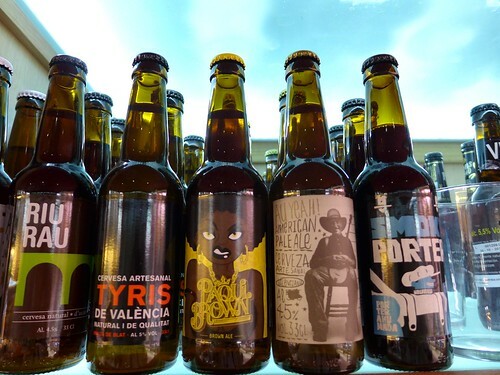 There are also a few microbrews from the Valencian region. And quite a few beers are available chilled. 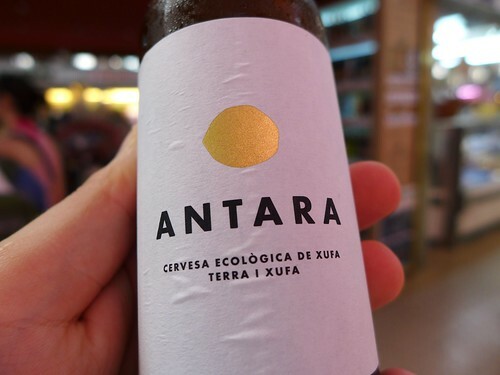 I opted for a Valencian beer containing xufa (the local “earth almond” which is used for making Horxata). It was delicously smooth, in between ale and lager. 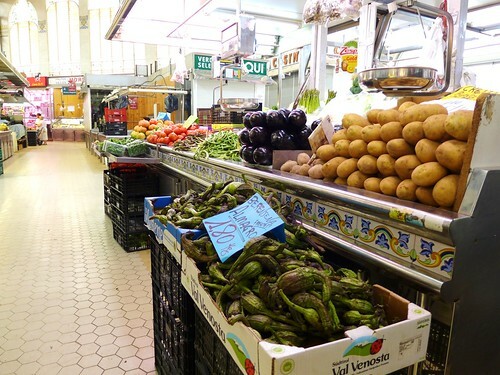 Veggies that don’t have supermarket-like perfection, but still look perfect, such as these eggplants.